The International Atomic Energy Agency is set up. The IAEA was created in 1957 in response to the deep fears and expectations generated by the discoveries and diverse uses of nuclear technology. The Agency’s genesis was U.S. President Eisenhower’s “Atoms for Peace” address to the General Assembly of the United Nations on 8 December 1953. The U.S. Ratification of the Statute by President Eisenhower, 29 July 1957, marks the official birth of the International Atomic Energy Agency. In the press conference following the signing ceremony in the Rose Garden of the White House in Washington, D.C., President Eisenhower evoked his address to the UN General Assembly in December 1953, at which he had proposed to establish the IAEA. The IAEA is strongly linked to nuclear technology and its controversial applications, either as a weapon or as a practical and useful tool. The ideas President Eisenhower expressed in his speech in 1953 helped shape the IAEA’s Statute, which 81 nations unanimously approved in October 1956. 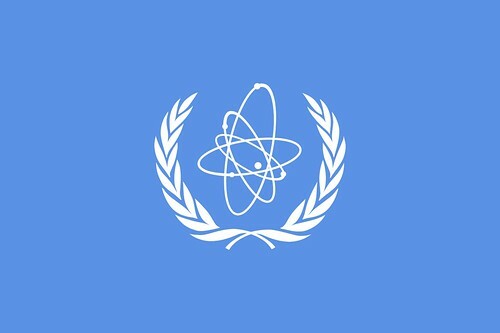 The Agency was set up as the world’s “Atoms for Peace” organization within the United Nations family. From the beginning, it was given the mandate to work with its Member States and multiple partners worldwide to promote safe, secure and peaceful nuclear technologies. The objectives of the IAEA’s dual mission – to promote and control the Atom – are defined in Article II of the IAEA Statute. In October 1957, the delegates to the First General Conference decided to establish the IAEA’s headquarters in Vienna, Austria. Until the opening of the Vienna International Centre in August 1979, the old Grand Hotel next to the Vienna Opera House served as the Agency’s temporary headquarters. The IAEA has also two regional offices located in Toronto, Canada and Tokyo, Japan, as well as two liaison offices in New York City, United States of America and Geneva, Switzerland. The Agency runs laboratories specialized in nuclear technology in Vienna and Seibersdorf, Austria, opened in1961, and, since 1961, in Monaco. The International Atomic Energy Agency comes into existence. The New York, Ontario and Western Railway makes its final run. The first artificial satellite to orbit the Earth, Sputnik 1 is launched. American Bandstand debuts on the ABC television network. The Gaither Report calls for more American missiles and fallout shelters during the Cold war.